Common skin complaints can be a nuisance. No matter how many products we use, how much water we drink, or how attentively we apply our sun protection, our skin can still surprise us in the exact ways we’d rather it not. As many as 6 in every 10 Britons have suffered from a skin condition like acne, and even after we’ve banished the root cause our problems can still plague us. We’d love to introduce you to a fantastic treatment that tackles all the skin complaints we’re about to share with you. Whether you’re battling with acne scarring, or trying to counter a dulling complexion, your solution lies in microneedling with Omniya. Acne scarring occurs when the body tries to heal itself by either over-producing or under-producing collagen that form small scar pockets. Scarring may feel permanent, but it doesn’t have to be. Microneedling uses its tiny precise needles to puncture the skin in the scarred area to bring about a small, controlled wound. This wound then prompts a natural healing response, much more controlled than the previous attempts of the stressed skin, to introduce cell turnover in the area. This smooths out your acne scars effectively and naturally, leaving your skin regenerated. Enlarged pours can be genetic or amplified by oily skin and can sit unkindly on the face. They can even be visible under makeup which, for those who wear it, can be frustrating and embarrassing. The controlled punctures of the microneedles help to downsize the stretched pours by encouraging the skin to reform around them, lessening their visible appearance. As we age, we lose collagen and elastin at an alarming rate. These proteins are the components that keep our skin plump, firm, and tight, which is why we lose our youthful appearance. 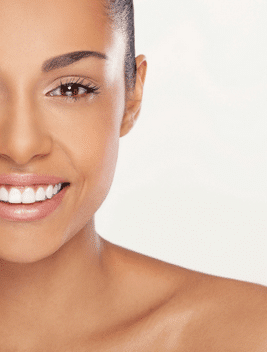 The precise punctures of microneedling can actually stimulate new collagen growth, prompting an internal healing process and positive skin cell turn over to revitalise our skin. This can aid in the visible improvement of fine lines and wrinkles on the face. Sometimes, our skin loses its vibrancy. Ageing skin with declining collagen levels can sometimes appear dull and tired-looking, but younger skin can also experience this loss of glow if there is a build-up of dead skin cells on the surface. With the regulated wounding the microneedling encourages, new collagen is produced. By healing from the inside out, the skin naturally produces new cells and flushes away the dead or dying. This can introduce a new freshness and vitality to the skin, helping to improve your overall complexion. While skincare products are great for regulating oil and cleansing away makeup, sometimes our skin needs a push in the right direction. Microneedling with Omniya can not only treat acne scars you thought were permanent, but also help to rebalance and reinvigorate your face. Why not speak to one of our skincare specialists regarding a free consultation? Call us on 020 7584 4777 or enquire online today.